When our appetites are aching for spicy and exciting Cajun flavors, we have the tendency to indulge in a large bowlful of Cajun sweet potato and seafood chowder to satisfy our cayenne pepper craving, we’ll choose simple grilled pork chops on a more laid-back day. Sometimes we’ll even go for a steaming pot of Paleo jambalaya, which is more Creole than Cajun, but the difference is subtle enough that we get to enjoy the best of both Louisiana cooking styles. We are here today, however, for the mango glaze that combines melodiously with the sirloin steaks. 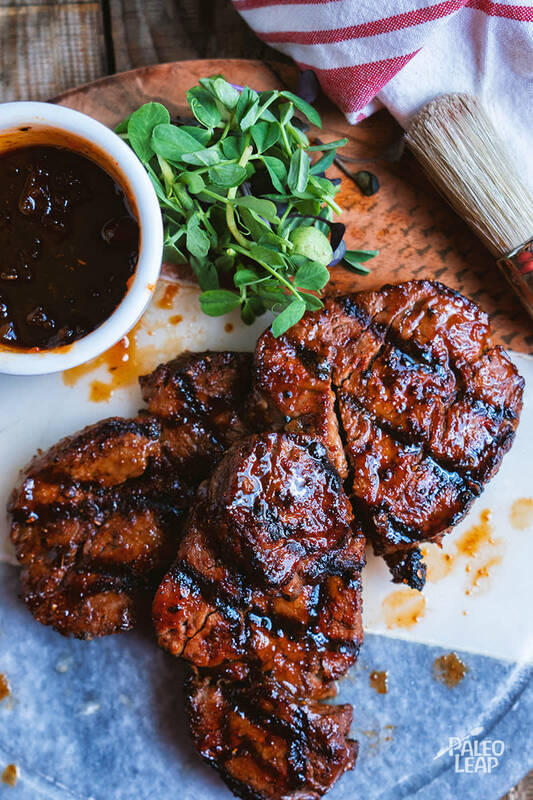 Lime, jalapeño, coconut aminos, orange juice, honey, mango, garlic, ginger and Cajun spices – all of these ingredients are gently simmered together, the flavors melding into one another to create a sweetly spiced glaze that can be drizzled over your perfectly grilled steaks. Likely, you’ll be dreaming up a version of some home fries to go with your saucy steak, let us be the first to tell you that grilled and zesty sweet potatoes will never let you down. Try them once, and you will be making, and remaking them till your love of sweet potatoes remains. Mango and steak is the perfect dish for eating any night of the week, though we imagine it is also marvelous served at an informal dinner party too, so get your grill ready, source those ripe mangoes and get to work! Your guests will be super pleased with the results. Add all the ingredients for the mango glaze in a saucepan over medium-high heat. Bring to a boil and simmer 10 to 12 minutes, or until sauce thickens. In a bowl, combine all the spices to make the cajun seasoning. Season the steaks generously on both sides. Grill the steaks 3 to 4 minutes per side, or until cooked to your desired doneness. Drizzle the spicy mango sauce over the steaks and serve.